Welcome to our piece of Paradise! There isn't a better place to be than right here! Enjoy our spacious waterfront setting where the atmosphere is like a trip in a time machine to the way Key West used to be. So, come by to relax, take in the view of the boats and the water, and let us prepare you one of our mouth-watering entrees made with only the freshest seafood that our local waters provide! Then indulge further with one of our delicious refreshing "House Specialty Libations!" Our History Throughout Key West's colorful history the Historic Key West Bight, where the Conch Republic Seafood Company now resides, has had a tradition of bringing the bounty of the seas ashore. Sponges, giant sea turtles, shrimp and fish are just a few of the types of cargo that would pass through the Bight weekly. The location where the Conch Republic Seafood Company is now located has it's own interesting history. In the 1890's "sponging" had grown to employ hundreds in Key West, both with the fleet and at jobs ashore. Our present day docks have long ago replaced the large, wide sponge market docks of the era. This dock was just one of many constructed to allow the quality of the sponges to be inspected by wholesale buyers prior to sale at auction. Large "mother ships" would dock after a few weeks of harvesting and unload their cargoes. The thousands of sponges bought, sold & traded were shipped all over the United States. By the early 1900's, Key West was considered the Sponge Capital of the Country. In 1949, found almost by accident, vast beds of succulent pink shrimp were located just offshore near the Dry Tortugas in the Gulf. As word of the find spread, hundreds of shrimp boats were soon operating out of the Bight. At one time there were so many shrimp trawlers at the docks, you could walk the length of the seawall from one boat to another without touching the water! The property on which the Conch Republic Seafood Company and the Conch Farm Education Center was once the Singleton Fish House and Ice Plant. The ice plant once boasted as the largest in the world, allowed for more efficient unloading and processing of the shrimp catch. Each day, at the peak of the shrimp season, dozens of shrimp trawlers unloaded at the docks right behind the Conch Republic Seafood Company, packed in wooden crates and iced for shipment. Often in the warehouse, hundreds of workers stood at long tables in what now serves as the Main Dining Room of the restaurant, and deftly removed the inedible heads from the shrimp before packing. The industry remained a lucrative business in the Bight into the 1980's. In the 1990's the property saw some major changes. Dean Rollings, president of the Florida Straits Conch Company, presented to the City of Key West a plan to create a unique, educational, environmentally correct & entertaining development of this waterfront site. The large warehouse once known as "Fish House No. 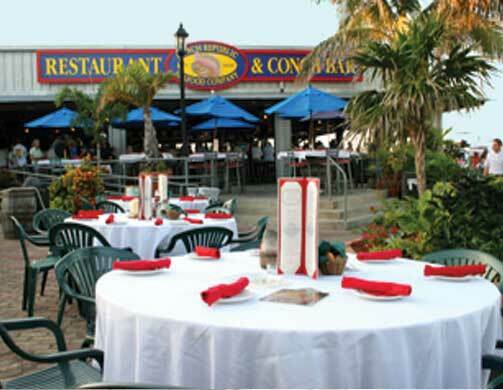 4" has been transformed into the present day Conch Republic Seafood Company. The building that housed the ice plant itself is now the Conch Farm Research and Educational Foundation, Inc. This education center is a working laboratory and museum. Integrated into the construction of the restaurant, bar and education center, materials salvaged from the plant, processing plant and original docks can be found everywhere. Even the menu received special attention. It consists of tantalizing Florida and Caribbean Entrees bound to please the most discriminating taste. Fresh seafood is delivered daily to our docks from the waters surrounding Key West, continuing the tradition found in the Bight's History. The goal here is to treat locals and visitors alike to an environmentally concerned enterprise that not only delights the senses, but teaches as well. As we move forward into the new millennium, the Conch Republic Seafood Company will continue to charm and educate its visitors on our slice of paradise.